London, W5 5SA, U.K., 335 pages. Three hundred years old, Lloyd’s of London was once a byword for fair dealing and trustworthiness. It was brought to the brink of financial catastrophe by rampant greed and dubious practices, which were allowed to flourish unchecked by the management. It’s a fascinating story,part morality tale and part corporate intrigue, that is made all the more interesting because of the spirited narrative, which sets down the facts but never ignores the human element. The author is a distinguished journalist, but his own enormous losses have made him less than completely disinterested. The book’s tone is irate, but the author never loses his perspective. 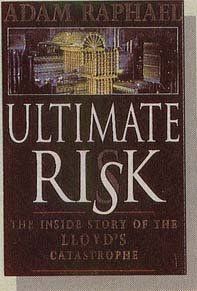 The story of Lloyd’s financial misadventures and its prospects for the future is engagingly and carefully laid out in a cautionary tale which, as yet, has no happy ending. Raih penghasilan hingga 50 JUTA setiap bulan dengan SEDIKIT MODAL Melalui 1 LANGKAH MUDAH SISTEM ANTIMISKIN. Jika memesan HARI INI juga GRATIS PULSA 20ribu + SUPER BONUS Ebook " TRIK MERAUP RIBUAN DOLLAR DARI GOOGLE & AMAZON"
dan SOFTWARE CANGGIH Senilai JUTAAN RUPIAH Secara CUMA-CUMA. JAMINAN GARANSI 100 % Uang Kembali 3 KALI LIPAT jika tidak berhasil. Yakini Takdir Anda Untuk Menjadi Kaya.